It’s not hard to confuse the clopping of heels on Tallinn’s medieval cobblestones with the plink of coins on the merchant’s counters. Trade has fueled the city’s fortunes since medieval times, when Tallinn achieved its first golden age as an enthusiastic member of the Hanseatic League, a trading organization that flourished during the Middle Ages. Whatever the fortunes of history, the mercantile mentality remained alive and well and eagerly embraced capitalism after Estonia regained independence in 1991. Now tied to the European Union, business flows into Tallinn from around the world. 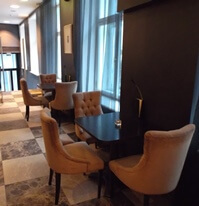 The elite of the traveling business class check into the Hotel Telegraaf, just a stone’s throw from the town square. Erected in 1878 as a banking house, the Peter Schreiberg-designed building was transformed into the city telegraph and post office after World War I and stayed that way until 1991. 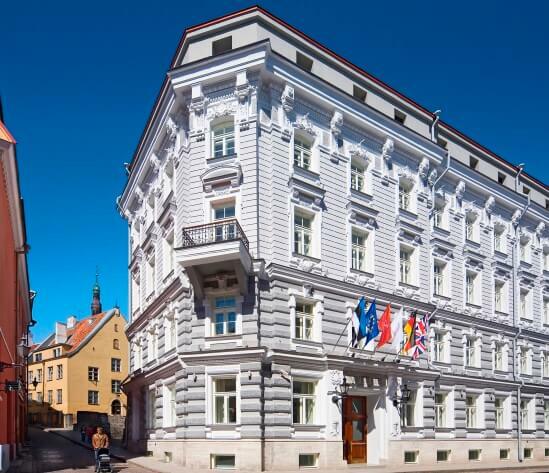 The building was then purchased by three local Estonian businessmen, who gave it a thorough renovation before reopening in 2006 as the Hotel Telegraaf. Stepping through the front door into the lobby, the hotel’s tone is immediately set by shades of black, grey, and white in the checked marble floors, armchairs, walls, and artwork. The well-pressed, smart, conservative suits and dresses of the staff come in similar shades. Happily, the professionalism in the attire is also found in the action. From check in to check out, everyone knows his or her role and executes it flawlessly. Upstairs, 86 rooms, in 5 classes — comfort, executive, superior, junior suite, and suite — are spread across several floors in the original structure up front and a modern rebuilt wing in back. My room, an executive single (starting at $230), was in the former. Inside, the room echoes the lights and darks of the lobby, but with a few strategic splashes of color . The bed sits at the far end of the room to the left, while the entertainment and social area on the right are anchored by a desk, flat-screen TV, and armchair. The bathroom, handily off the bed area, offers the only change, with lighter beige walls, heated floors, and plenty of Elemis shampoos, lotions, and creams. 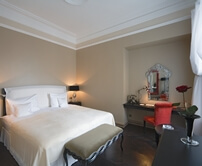 The bed is another highlight, with an exceptionally soft mattress top and a “pillow menu” if more is needed. 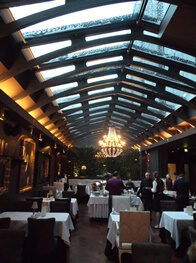 You’ll want to get out of bed each morning for the breakfast in the Restaurant Tchaikovsky, adjacent the lobby. The setting is a beauty with a curved glass roof atop 19th-century gallery style walls complete with period portraiture in gilded frames. Choose from the extensive buffet of meats, cheese, fruit, porridge, herring, bread, jam, nuts, and pastries or select warm dishes like eggs benedict from the menu. During the day and evening, Tchaikovsky gets even better, with a nouveau Russian menu featuring dishes like Lavaret and Kamchatka crab salad, royal blini with caviar, and roasted pigeon fillet. Be sure to order at least one pavlova for dessert before leaving the hotel. More pleasure waits in the Telegraaf’s Elemis Spa. 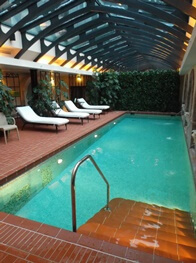 In addition to excellent hot and wet saunas, the spa houses a remarkably large (for the area) swimming pool and hot tub. All guests have free access, but must pay between 50 and 120 euros extra for any of the 30, 60, 75, 120-minute massages and treatments, which use Elemis product. It’s in the massage actually that the Telegraaf’s one weakness can be found. The hands are firm, well-practiced, and utterly professional, but do not provide the transcendence of the best massages. The same can be said for the hotel as a whole. The execution of hospitality and duties is a veritable master class in hotel operations but stay within the lines. Without risk taking, exaltant thrills are hard to find.